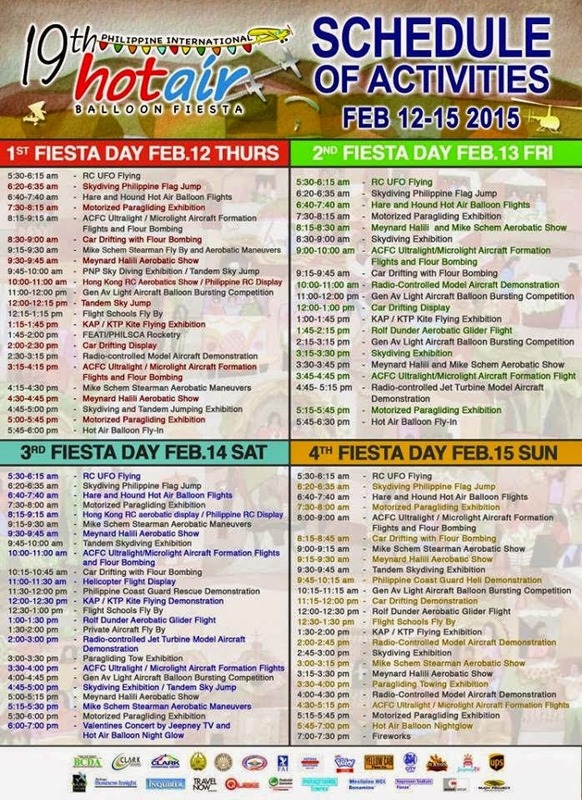 Event Invite: 19th Philippine International Balloon Fiesta 2015! When I first saw the event details on the balloon festival while browsing my FB feed, I immediately remembered the memories Jaycee and I had when we first attended the same event last year. This time, Clark will be hosting the said event unlike last year's Lubao which was really far away on our end. We were actually planning if we can visit on Saturday but since Jaycee will be out from work on Saturday AM, I don't think we will be able to see the balloons fly in the morning. Plus, he needs to sleep because he just got off from work. There is the Hot Air Balloon Night Glow though at around 7pm so I guess, we can go for that. I just do not know if they will be pulled out from work and will be sent there to guard just like last time. By the way, he's a policeman so anytime, he always got confusing schedule. Last year's date was only during his work so we weren't able to tour around the whole place. While he was guarding at the event, I was just there taking photos like a stranger beside him. Haha. Still glad we had moments like this. Hope we can visit this year's event at Clark. I guess this is better than last year since SM Clark is just a ride away from the venue so in case you'll get tired, you can just rest at the mall. Last year's weather was so hot and there was no mall or shelter around.